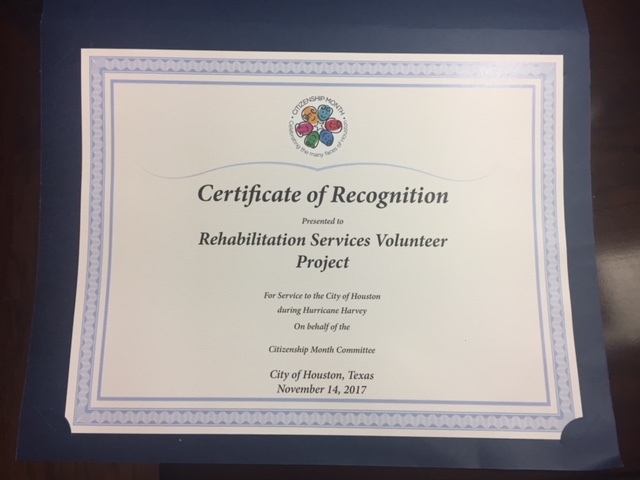 Rehabilitation Services Volunteer Project (RSVP) receives a Certificate of Recognition from the City of Houston Citizenship Month Committee for services to the City of Houston during Hurricane Harvey. RSVP had incredible volunteers during the recovery of Hurricane Harvey. Thank you Citizenship Month Committee for this gracious recognition. We are proud to help our Houston community by providing medical services and medical equipment to individuals with disabilities.